As of Friday morning, more than three million gallons of raw sewage had flowed from the site of the broken pipe, and that number will continue to grow, the Washington Suburban Sanitary Commission said. 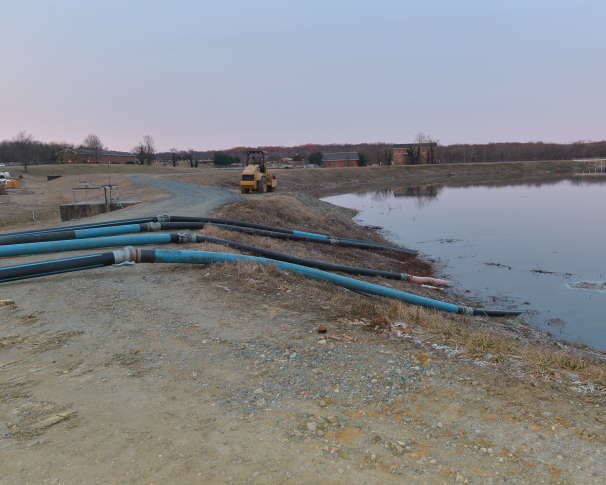 WASHINGTON — Millions of gallons of raw sewage have been pouring out of a ruptured pipe at a wastewater treatment plant in Accokeek, Maryland, and a complicated repair process to remedy the problem could take days, according to the Washington Suburban Sanitary Commission. “This is not like fixing a broken water main on your street,” said spokeswoman Lyn Riggins, with WSSC, which serves Prince George’s and Montgomery counties. The overflow is not affecting drinking water. A pressurized sewer main broke at the Piscataway Wastewater Treatment Plant Thursday afternoon. As of Friday morning, more than three million gallons of raw sewage had flowed from the break site, and that number will continue to grow, WSSC said. The plant normally treats about 24 million gallons of wastewater per day. Initially, for about 10 hours after the break, sewage was flowing into Piscataway Creek, a tributary of the Potomac River. WSSC crews have since set up a temporary system so they can pump the sewage into retention basins and keep it from going into the creek. Signs have been placed around the area, warning people about the ongoing overflow. “We’re going to do everything we can to minimize the impact to the environment,” said Riggins. It is not clear how much sewage ended up in the creek before WSSC set up its temporary pumps. The broken pipe, which takes wastewater to the plant for treatment, will need to be repaired, but there is no way to stop wastewater from flowing through in the meantime. WSSC plans to set up some 2,000 feet of temporary pipe to guide wastewater into the plant instead of the retention basins. WSSC said a contractor will dig into the ground to figure out what caused the break, what sort of repairs are needed and what equipment needs to be brought in.